Many cores allow specific equipment to be scheduled only if a user has specific permissions, which means that Core Administrators need to keep their permission status in iLab up to date. 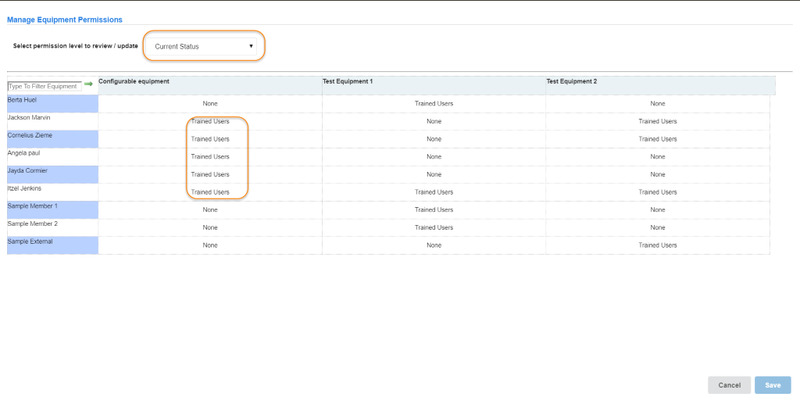 Managing permissions is typically done from the People Tab of your core or through each individual piece of equipment. You can set the permissions group for a number of selected users all at once. To do so, first select the users you want to update by clicking the check-boxes on the right-hand side of the screen (you can click the check box in the top-right to select all listed users). Then, click the "Manage Equipment Permissions" button at the top of the interface. Alternatively, you can click on the microscope icon for an individual user to just update that specific customer. In each case, another interface opens up that shows the current permission group assigned to each user. To change permissions, you will need to select the permission group you would like to assign from the drop-down. Use the dropdown to select the permission you would like to update. 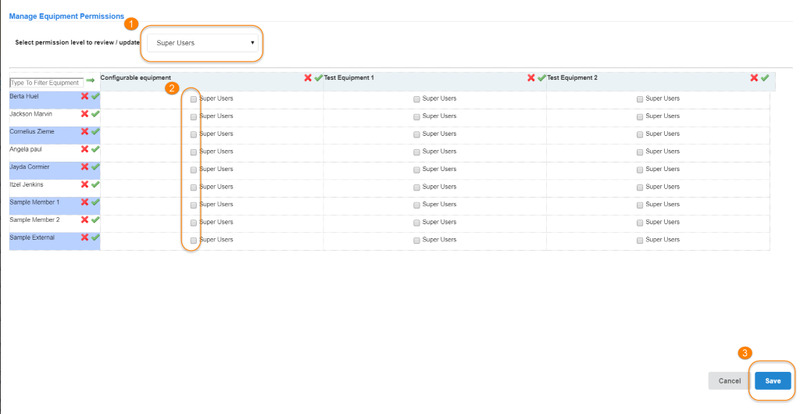 Check the box to select that permission for the user/group OR use the green checkmark to add that permission for all users in the column or for all instruments for a user in the row. Conversely, to de-select all resources, click the red X beside the user name. Permissions have now been updated across users and instruments.